For many, alcohol is a manageable and controllable part of their social life and it causes them little harm or worry. However, regularly drinking more than 14 units a week (approx. 6 pints of average strength beer or 5 large glasses of wine) can lead to a wide range of long-term health problems. If you, or someone you know is drinking more than they think they should or would like to cut down, please see below. 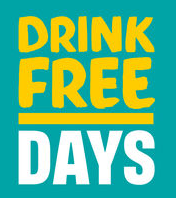 The PHE and Drink Aware recommended One You Drink Free Days app is a useful tool to assist you in reducing your alcohol consumption. Compare your drinking to the rest of the UK and see the difference drink free days could make by using the Drink Compare Calculator. Have a few (2-3) alcohol free nights a week. Change your ‘after work routine’ – Start putting the kettle on when you walk through the door instead of going to the fridge for a wine or a beer. If a friend drops in, offer them tea/coffee or juice. If drinking alcohol, make every second drink non-alcoholic – ‘a spacer, not a chaser’. Eat before you drink alcohol, it will make you feel fuller so that you are less likely to drink quickly.